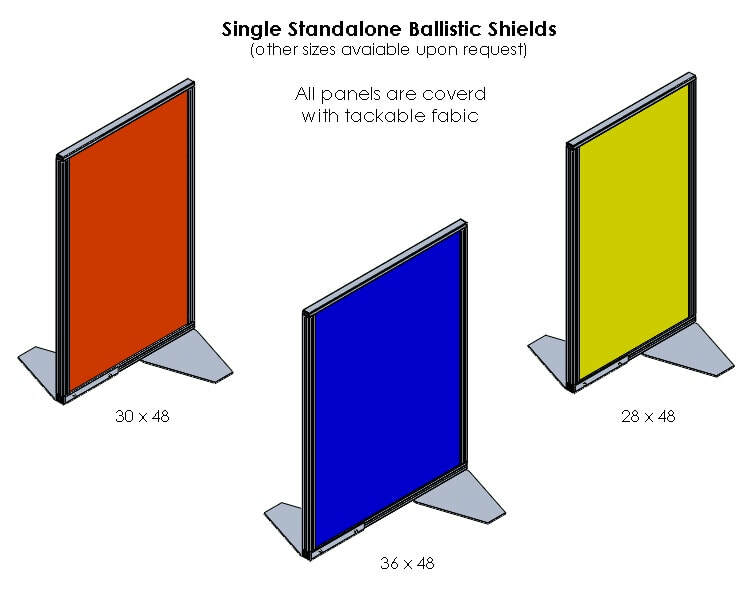 OFFICE ARMOR - BALLISTIC Shields and office armor cubicles. Armor to protect the work place. Armor to protect your people. Unfortunately it is now necessary to consider protecting the work place. If your people are highly exposed due to location or nature of your business or public service it is important to seriously consider their safety. CMI has worked with the Marine Corps. in developing an office armor system that is non intrusive and looks like a normal office cubicle. The big difference, it will protect your people from multi hit from hand gun and high power rifle rounds. 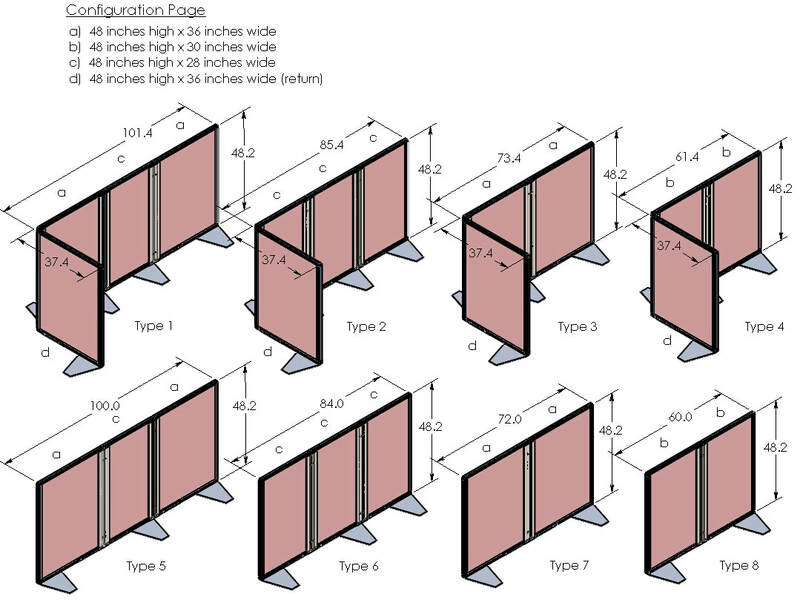 OFFICE ARMOR CUBICLES are available in 6 mm (NIJ level III) and 8 mm (UL level 8) armor plate . See charts below. Contact us for details. The design of these bullet resistance panels is a product of Cellular Materials International (CMI) work with DOD and DHS for more than 15 years on many blast and ballistic programs. The goal was to produce a unique piece of office furniture that that doesn’t look like armor but meets or exceeds a NIJ level III protection. Our solution is streamline, with clean and modern lines and not over powering in appearance. The only thing one sees a highly finished anodized aluminum frame with a colorful fabric panels. First: we use armor steel to achieve the number one goal, protection. We use armor plate because it works better than anything available on a multi hits basis. Unlike armor made from composites, steel armor is lighter can take many hits in the same location and the cost of armor plate is a fraction of common and exotic composites . Second: . The uniqueness of our design is in the use of Aluminum Extrusions to assemble the whole system. . 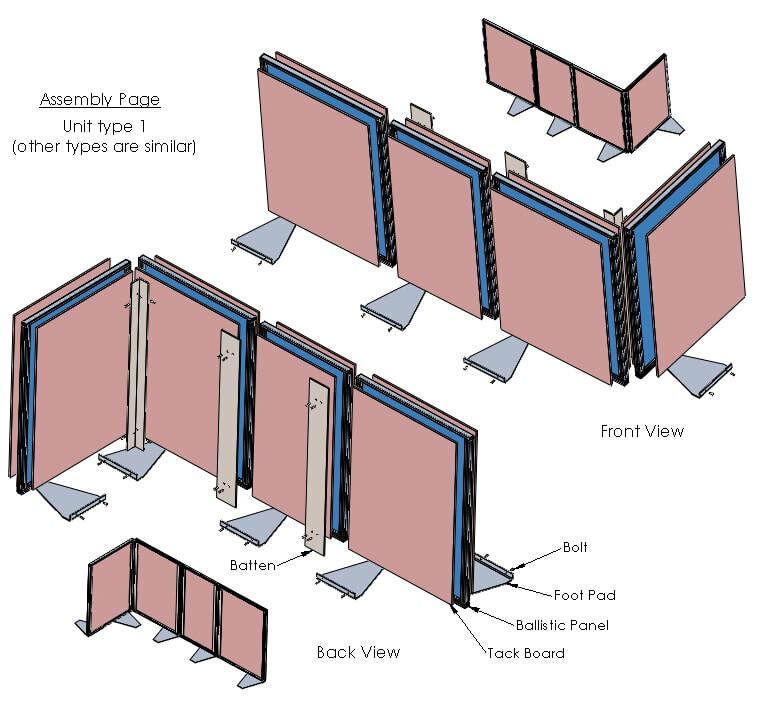 This whole panel can be assembled with one wrench,using two workers and it typically takes less than half an hour. Third: Mineral Fiber Board covers the steel plate. This material was selected because it provides an ASTM E 84 fire rating This material is mineral base not wood fiber like most tack board and yet works well with thumb tacks. It also has very low VOC emissions. Fourth this component is our spall liner composed of E-glass. Once again, it has an ASTM E84 fire rating. This material is placed between the fabric and the Mineral Fiber Board and has proven to be an effective mitigator of spall and ricochet. Fifth: is the fabric. This item can be specified in a number of colors and textures and will be adhered to the fiber board. Collectively the system achieves a ASTM E119 fire rating due to its metal components. The outer fabric and tack board are easy to change because they are Velcro applied. Our solution has a patent pending that involves the unique assembly of this system. Never again...... Our design was a direct result of being contacted by the Marines to DEVELOP a system to protect future lives. ​ Four Marines were killed. ... Chattanooga shooting: 4 Marines killed, a dead suspect and .... Armed man stands guard at recruitment center ..... three people were injured: a police officer, a Marine Corps recruiter and a sailor. Our shields were originally developed for the military. But, due to budget restraints, large numbers of Police, Sheriff and Security departments find it hard to justify this type of protection. We now have a leasing program for Municipalities. Your department can have the protection it requires at a small monthly payment. 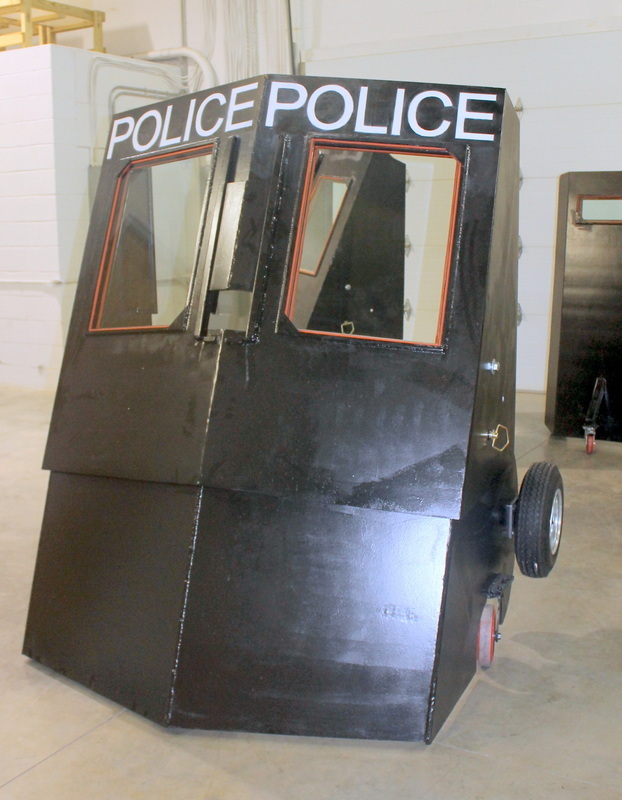 Contact us to see the type of protection you can provide for your department for a couple of hundred dollars a month. Question..... what would you rather stand behind? "Less weight, Cost efficient by a factor of two and most important... much better protection for real world multi shot protection. Chattanooga recruiting center ..." estimated there were 30 to 50 shots fired "
San Bernardino terror attack " the suspects fired about 80 rounds from rifles"
Orlando nightclub ...... "49 dead," Fort Hood Shooting .... "13 dead."